The entrance to Line Installation 1-4. Line Installation 1-4 is a Forerunner Line installation located on an unidentified moon in Sub-sector 35. One of millions of similar facilities comprising the Maginot Line, Line Installation 1-4 was constructed by the Forerunners as an outpost used to prevent unsanctioned ships from entering the core systems of their ecumene. The Line installations were most notably employed during the later stages of the Forerunner-Flood war, when they acted as the final line of defense for the Forerunners. Line Installation 1-4 possessed a powerful energy weapon capable of shooting down any ships passing nearby in slipspace, causing them to crash down on the moon. The installation also served as a Flood research center, with extensive facilities and native AI protocols designed with this function in mind. The Installation had its own Monitor, named 686 Ebullient Prism, which had a sizable force of Sentinel and special Gatherer units under its command. The Installation itself is a vast underground complex with tunnels and hallways reaching kilometers deep, including a number of open, bottomless shafts characteristic of Forerunner architecture. Similar to a number of other Forerunner facilities, portions of the installation appear to have been designed exclusively for Sentinels, as vertical or angled service tunnels are more frequent than walkways. 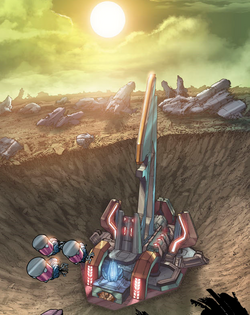 Due to the Installation's active defense system, the moon's surface became littered with wreckages of ships over the course of history. During the Human-Covenant War in the mid-2500s, the ONI vessel Long Time Coming, as well as the Covenant assault carrier Clarity of Faith were shot down by the Line's defenses while in Slipspace. They both crash-landed on the moon and some of their personnel were taken by Gatherers into the main facility of the Installation, for study by 686 Ebullient Prism. In the ensuing conflict, the installation's control center was located and used by Team Black to shoot down an entire Covenant fleet in slipspace. The Installation's control center appears near-identical to that of the Relic on Harvest in Halo Wars, complete with holograms of star systems. As such, the relic may in fact be another Line installation. Readout of the facility's tunnel system. Gatherers in the installation's central area.